Glenrothes Cricket Club has been targeted by vandals for the fourth time in ten days. Water pipes have been destroyed and there were unsuccessful attempts to break into equipment stores. The latest attack on the Club yesterday evening saw the remaining CCTV security cameras, vandalised previously, pulled down. 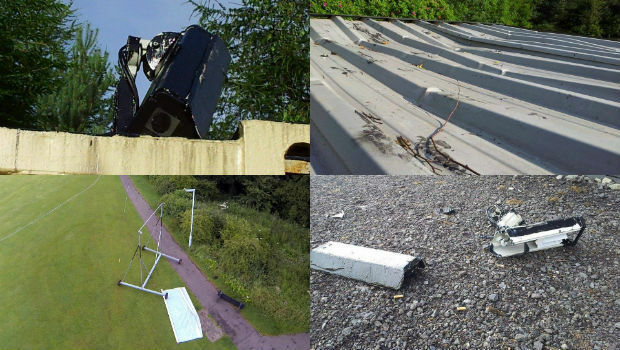 There were attempts to damage the steel pitch covers, installed after previous vandalism to the pitch and these have been left with severely dented. One of the cricket sightscreens has been badly damaged after being rammed into a bench and the bench has been knocked off it’s sockets. There have been increased police patrols in recent days but these have proven to be ineffective against some very determined vandals. Glenrothes Cricket Club representatives are set to meet with Fife Council and the Police to discuss what can be done. Glenrothes Cricket Club are a much valued organisation in the town who run school holiday summer camps for children and they have also recently opened an indoor cricket centre. The Fife News Online team would urge anyone with any information about the persistent vandalism to contact Fife Police on 101 and ensure this excellent community-focused organisation has a bright future in the town. .